Like FOX and ABC, NBC has ordered their own time-travel series called Timeless, The Wrap reports. The network has also given a 2016-17 series order to new comedy Marlon and the supernatural drama Midnight, Texas. Abigail Spencer, Matt Lanter, Malcolm Barrett, Goran Visnjic, Paterson Joseph, Sakina Jaffrey and Claudia Doumit will star. What do you think? Are you a fan of time-travel series? Will you watch Timeless? More about: NBC TV shows: canceled or renewed?, Time, Time: canceled or renewed?, Timeless, Timeless: canceled or renewed? 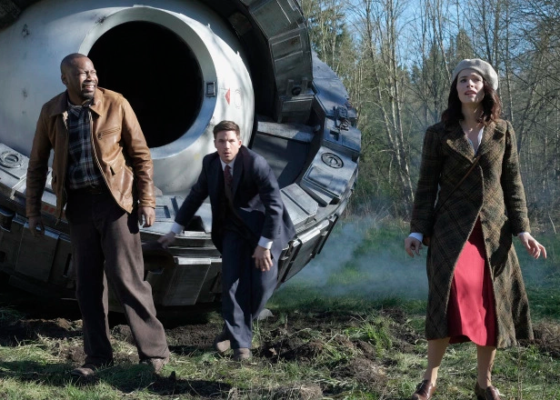 We enjoyed Timeless, Something historically new and creative for us to watch. How could any one shout this series down after one season. l guess there wasn’t enough blood and guts or even zombies in the script . Shame Shame. Finally a clean, family-friendly tv show that has substance and good history lessons all in one! Please keep this show alive. The concept is poor to say the least. Didn’t bill & Ted teach us anything? Guy steals time machine, use second time machine to chase said guy through history? Hell no. Go back ten minutes before first machine is stolen and break it/arrest guy. All fixed, end of series. So I’ll not be bothering with this. Out of the three time traveling series that got picked up as series orders, Timeless is the most promising show I’ve ever seen because of the concept and I like the creative duo of Eric Kripke and Shawn Ryan.